Photo provided by Mark Nixon - we're still not sure who took it!! Since starting out in the primordial-ooze of the Calgary-based garbagy/garagy Color Me Psycho, entertainer Jackson Phibes has been dishing out macabre-tinged rockin' slop to disbelieving audiences for over 13 years. CMP managed to stay together for 3 years of tyranny and stagnation, releasing a few tapes and one full-length piece o' vinyl (the now collector's item "Pretend I'm your Father" album). Immediately following the demise of his first ill-fated stab at the small-time, Phibes (who was still toiling under the dubious nom de axe, Aleister Hexxx) set about initiating a head-long dive into the horror-rock ghettos with the Forbidden Dimension. 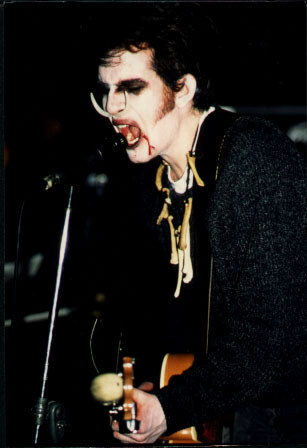 The FD began originally as a one-man band, but over the course of ten years, Phibes managed to sucker a host of other musicians (some quite accomplished, others still in their training bras) into accompanying him. Three full-length CD's were recorded and released by the now defunct Cargo Records. These, along with a handful of blood-drenched singles on various small labels brought a smallish, but ardent international cult audience to pestering Phibes and his crew for autographs, epitaphs and vials of bodily fluids. In the summer of '98, Phibes' cohorts in the then-current line-up of the Forbidden Dimension decided to get Religion. Phibes remained, holding the bag of goofer-dust at the crossroads of his own fevered imagination. "Horror Rock or Die" was his cry, so he died anyway, and then came back. Retrieving his crimson-stained guitar from the ashes, he set out on his new solo night drive to the nether-regions of a musical genre which he has always referred to as Gothic Trash. 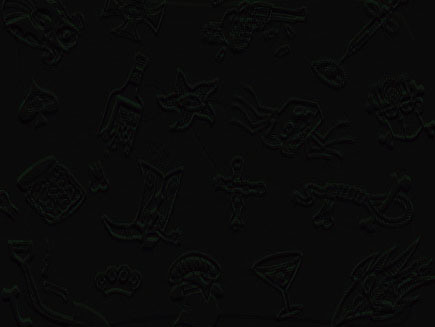 All graphics on this site © COPYRIGHT Tomb 2003.